1. Download and install libewf from Ubuntu Software Center. 2. Download mount_ewf-20090113.py from here. Rename to mount_ewf.py and copy it to /usr/bin folder. Set 755 permissions on it so it can be read and executed by all users. This python script requires a mount point location (folder) to be specified. For every image we want to mount, we will need to create a new mount point and then feed it to this script. We will create temporary mount points under /tmp. Each mount point will be named ewf_NAME. 1. Create a mount point. 2. Run mount_ewf.py script to mount the image. 3. Mounted image folder should pop up in Files Explorer. (note: there are no line breaks in parameters, it is all in one line) Don't change anything in the parameters, especially the quotes. I've settled on this command line after many iterations of failed attempts. This one takes care of all spaces in file names (and file paths) and should be fine for everyone. In the 'Basenames' tab, create 2 filters for filename as '*.E01' and '*.e01' so that the menu item only shows up for files with an E01 extension. One more setting is required to make this work. 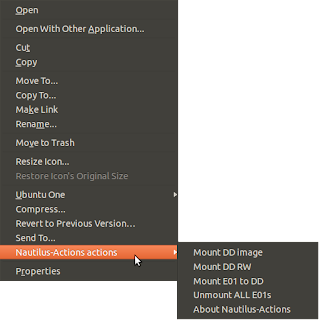 In the 'Execution' tab, select 'Display Output' under Execution mode. This won't work otherwise. Thats about it. You should now see a menu like the one shown below when you right click on an e01 file. Choose 'Mount E01 to DD' to mount it to a virtual DD image. The folder should popup upon operation completion. 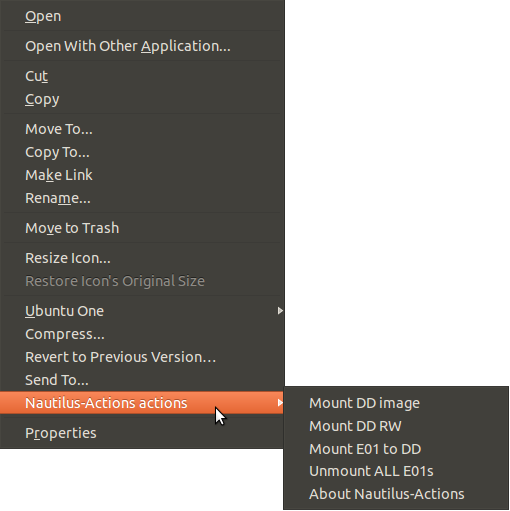 Now right-click on the DD image file and select 'Mount DD image' to mount the partitions. Now for the unmount command. I've created a simple generic 'Unmount all' command that unmounts all E01 files that were previously mounted (using our one-click solution). Since we do not maintain any record or database of mounted files, we simply reply on file names to identify mounted folders under /tmp. In the 'Execution' tab, select 'Display Output' under Execution mode. Thats it! Do remember to unmount your virtual DD images in File Explorer before trying to unmount the E01. Here is a video showing the entire concept implemented on my machine.